To improve the green environmental performance and barrier property of the food packaging paper materials, the dialdehyde chitosan (D-CTS) was prepared from the selective oxidation of chitosan by sodium periodate. A surface sizing agent was obtained through complexes of D-CTS and cationic starch (CS). The barrier properties for water vapor of paper-sheet coated by the complex sizing agent of D-CTS/CS were measured. Attenuated total reflectance-fourier transform infrared spectroscopy (ATR-FTIR) was used to explain the mechanism of the improved barrier properties. The results indicate: while the oxidation degree and concentration of D-CTS is 32.3% and 0.3 wt%, the optimum barrier property for water vapor was obtained. While the coating weight increased from 0 to 3.5 g/m2, the barrier property for water vapor (WVP) was reduced from 2.73 × 10−11g cm−1 s−1 Pa−1 to 0.81 × 10−11g cm−1 s−1 Pa−1, reduced by 70.33%. Analyzed by ATR-FTIR, the degree of cross linking between D-CTS, CS and fibers increased. A smooth film formed on the surface can improve the WVP significantly. This research was financially supported by university students’ science and technology innovation program in Zhejiang (new talent plan)—Preparation of grease-proof and biomass-based paper for food package, the Pre-research Project of Yiwu Industrial and Commercial College (No. 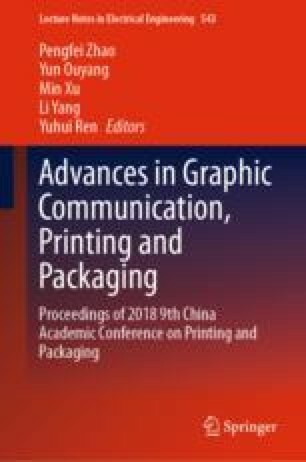 YY-SJ-201704), the research of Yiwu Industrial & Commercial College (No.2019JD305), the joint development project of printing media technology research center at YWICC and Yiwu printing and packaging industry innovative platform, and the 2018 Visiting Engineer Program of colleges of universities in Zhejiang (No. FG2018153).